The Nikon Z6 features the same video specs as the Z7, but has several major advantages since its a 24 megapixel camera. These include better low light performance and direct sensor readout with no line skipping or pixel binning. If you shoot a significant amount of video, this camera is the better choice, and its less expensive. The camera will do 8-bit internal video recording at both 4k UHD and 1080p HD. The following frame rate options are as follows. 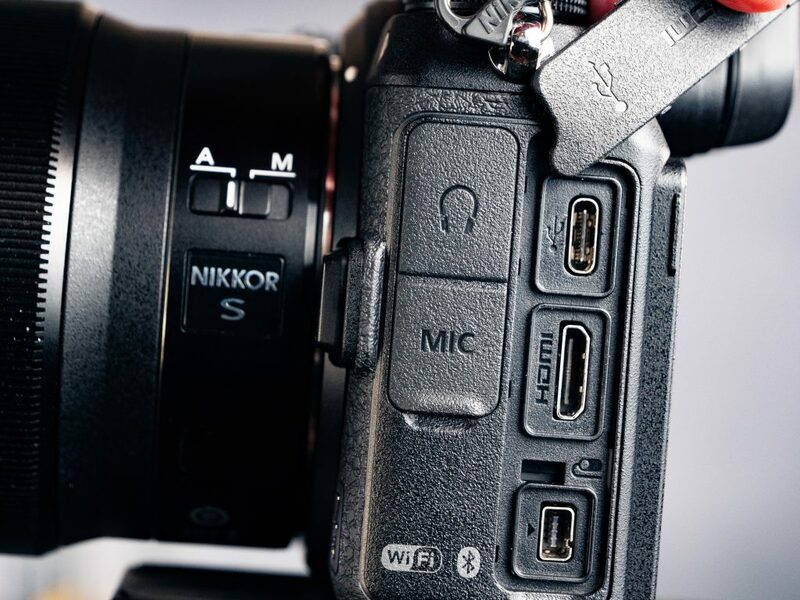 Internal video is quite good on the Nikon Z6, but where it really begins to shine is if you use an external recorder such as the Atomos Ninja V. You get 10-bit output and access to N-Log which is Nikon’s log profile. If you want to color grade, this is where you’re going to get the absolute best image quality. There seems to be a lot of confusion over the benefits of a higher bit rate. When comparing footage – you’re not going to notice much of a difference if any at all. So why is 10-bit considered “better”? A higher bit rate essentially means you’re recording more color information. While you might not notice the difference in the image quality – you will notice if you’re manipulating the image. If you need to rescue shadow detail you have more latitude because there is more data in the image. If you’re working with a green screen you’ll need this to clean up edges on your key. For casual shooting with minimal color grading 8-bit works fine. But if you want the ultimate control over picture quality you’ll want to shoot in 10-bit. This is why you only get the N-log option in 10-bit – it requires the image data since its designed for grading. The video quality is excellent. Its really nice to see Nikon step up in this area as they’ve always tended to lag behind the competition. This is an excellent camera for video. 4k is sharp and gorgeous – the color rendering is great in-camera. What really impressed me is the 1080p HD image quality. I moved to shooting everything at 4k about 2 years ago. At the time many DSLR type cameras shooting “HD” were actually upscaling from 720. It wasn’t sharp and didn’t look that great. The 1080p on the Nikon Z6 is fantastic and you can even upscale it in post to 4k without much quality loss. Its really that good. Int he video sample below – the slo-motion footage is all upscaled. Autofocus in video is a relative new-comer. This seems to be a feature everyone is talking about now but a few years ago it just didn’t exist in professional application. Dedicated video cameras have had it but it was rarely used in production. Now with the rise of YouTube and no-crew shooting, autofocus is essential in some cases – personally I use it all the time. Autofocus in the Nikon Z6 matches what you find in the still modes. Its not on par with the competing Sony cameras and there is no EYE-AF. That being said, the face detection is quite good. I actually trust this camera as an unmanned camera with AF at this point. It works well enough. Also nice is you can adjust the speed and sensitivity in the camera menus. If you want to do a rack focus – you can adjust it and just touch between two points for a nice cinematic effect. The video quality on the Nikon Z6 is some of the best I’ve seen on a full-frame mirrorless system. Sony still has the edge with autofocus, but the Nikon Z6 is only slightly behind. For picture quality you get 10-bit output which Sony doesn’t offer yet. Nikon have come a long way in video – this is finally a legitimate contender. They’ve had a few DSLR’s that had decent quality but it was all based in “live view” so you’d find quirks such as aperture control. I believe mirrorless has opened up an opportunity for Nikon that they have clearly seized.